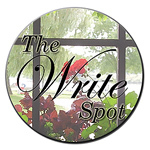 Welcome back to The Write Spot, a bi-weekly author series spotlighting the many and varied places where writers write. 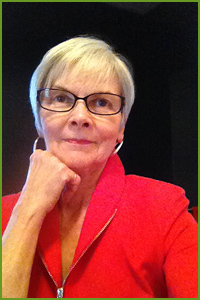 My special guest for this twenty-fourth edition is mystery author Linda Wiken, aka Erika Chase. Good to have you with us, Linda! A former mystery bookstore owner, Linda turned her computer to writing. 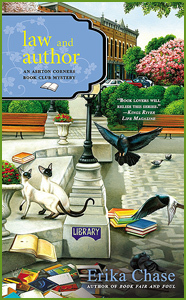 As Erika Chase, she has penned five Ashton Corners Book Club Mysteries. And these days, under her real name, Linda Wiken, she writes the Dinner Club Mystery series. All are from Berkley Prime Crime. Linda also writes short stories and is part of The Ladies' Killing Circle, a dangerous gang of dames who have put out seven mystery anthologies. Linda was honoured to be shortlisted for an Arthur Ellis Award from Crime Writers of Canada for Best Short Story, and for an Agatha Award from Malice Domestic for Best First Novel. She is owned by two Siamese cats who allow her to pursue her passion for chorale singing, and the eating of chocolates! What makes this The Write Spot for you? It’s The Write Spot mainly because it’s a room with a view. :-) I look out at tree tops and morning sun (which sometimes isn’t too helpful when trying to see the screen, I must admit). 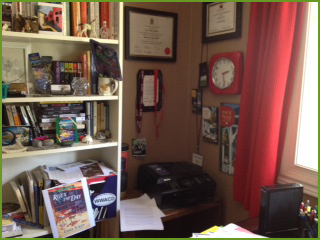 This dedicated office space is on the second floor of my home, a small room with two desks (one for writing; one for other things, such as paying bills and other personal matters), and bookcases along two walls. The room is bright and cheerful no matter what the weather, and that’s a great boost to the writing mind! Other than your computer or laptop, what's the one thing you couldn't be without in your Write Spot? My books! I love being surrounded by books. Many are reference and research books but the majority are for inspiration. Just looking at a cover or picking up a trade paperback gives me such a feeling of well-being and incentive, I could write forever. Or until dinner time, at least. I'm working on the third book in my Dinner Club Mystery series, from Berkley Prime Crime. The first one, Toasting Up Trouble, was released yesterday (yay!) and I handed in the second one, Roux the Day, in May and it will be out next summer. The title of the third is, Marinating in Murder. You heard it here first! I'm having such fun with these characters and especially the cookbooks. I'm a cookbook junkie and this allows me to have my fill. Thanks for the scoop, Linda! Love the titles. Where can readers find out more about you and your books? I love to connect with readers. My website is lindawiken.com. I can also be found at my alter ego website, erikachase.com. My Twitter handle is @LWiken; also @erika_chase. And, I make regular appearances on two wonderful blogs – Mystery Lovers' Kitchen, and Killer Characters. 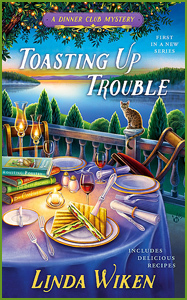 Linda's latest, Toasting Up Trouble, from Berkley Prime Crime was released yesterday (July 5, 2016). Get it while it's hot! Event planner Jennifer "J.J." Tanner has a full plate, but that's the way she likes it. First, it's her turn to choose the recipe for the next meeting of the Culinary Capers Dinner Club, a gathering of foodie friends who experiment with entrées for their creative and gastronomical pleasure. Second, she's organizing an Italian princess party for the twenty-one-year-old daughter of a high-tech millionaire. Bob Miller, retired police chief and member of the Ashton Corners Mystery Readers and Cheese Straws Society, is stunned by the arrival of his twenty-one-year-old granddaughter, Darla, whom he has never seen. Bob has been estranged from his own daughter for decades and hopes to make up for his absence in Darla's life. But some of the ladies of the book club find their Southern hospitality strained as they question the motives behind this sudden reunion. After a dead man is found in Molly Mathews's backyard, their concerns grow more serious. Lizzie Turner saw Darla arguing with the stranger the day before, but when the police question her, Darla proves to be an unreliable narrator. It's up to the book club to uncover the real story . . . before another victim is written into the plot. I've always been fascinated by what goes on behind the scenes. Whether it's backstage photos from my favourite play, a peek into the kitchen where a chef is working her culinary magic, or simply a glimpse through an uncurtained window into a stranger's private world, there's an undeniable thrill of discovery, a sense of secrets shared. It's no surprise, then, that I'm immensely curious about where other writers do their work. I've blogged about it before in this post about my own'write spot' and so enjoyed the comments, I was inspired to launch a regular feature here at stillpoint. 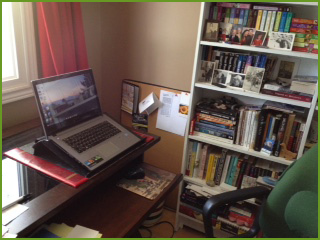 Watch for The Write Spot every other Wednesday and join me as I discover the many and varied places where writers write. 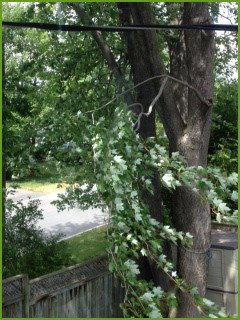 Linda, love that you look out onto a tree. They are so soothing. 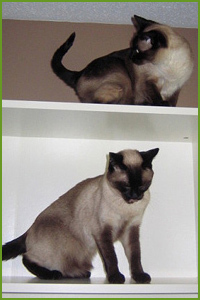 And, of course, I have to mention your two Siamese cats. Having a pet nearby can also be soothing (or infuriating if they are demanding attention). Your new series sounds like so much fun and I look forward to reading it. Linda, I enjoyed learning about you. Your book cover is intriguing--and of course, I love the two Siamese.